Coffee is a huge industry and one of the world’s biggest exports, second only to oil. It is an important part of human culture and one of our oldest traditions which date back centuries. The first bean was discovered in Ethiopia in the 9th Century and later spread across Europe and Asia. Today over 80% of Americans drink coffee every single day, and it is one of the most consumed drink worldwide. However, we all take our coffees differently, and everyone has specific tastes and flavor palettes. Even if you choose to buy your coffee at the local shop, instead of self-brewing at home, you want to know which coffee to order. It’s never just another cup of coffee. Every one is different. It’s never the same brew, even if they are both made with the same beans. From cultivation to final brewing methods, the process to create coffee is complex and is a craft people have been perfecting for over ten centuries. Most people might not know more than if they take their coffee black, with milk or sweetened. Coffees creation is much more complex than this. The bean itself and how it is cultivated and roasted is the foundation for any good brew. Similar to wine, coffee has notes of berries and varied acidities which all accounts for the type of bean you are using. 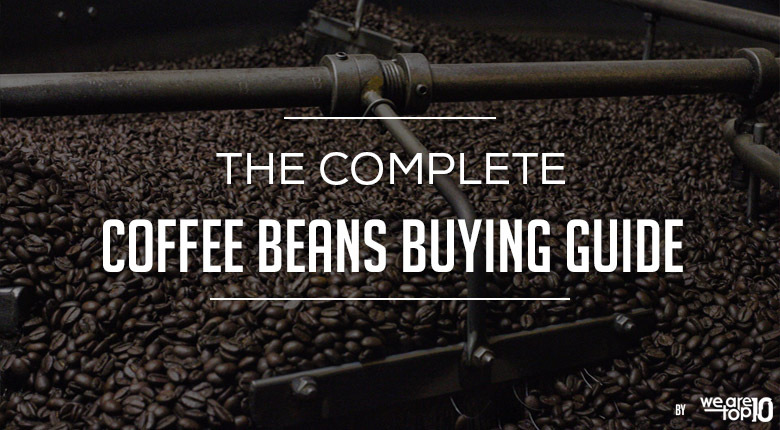 This guide will cover types of coffee beans, their origins and the details of their roast. These three categories are what give your coffee its flavor and taste. Review the following to identify and brew your perfect blend. Arabica and Robusta are two type of coffee beans that are grown commercially, and all coffees consist of either Arabica or Robusta even though there are more than 25 known species of Coffee but these two are the most commonly used. The Arabica beans are more expensive as they only grow at a higher altitude and takes longer to grow which reflects in its price. Don’t miss our The Definitive Coffee Maker Buying Guide 2018. Arabica beans are usually considered milder in flavor than Robusta beans. They are oval, rather than circular, in shape and provide a better-balanced flavor. Over 70% of the world’s coffee is Arabica bean and is considered as a premium coffee bean. This species of coffee bean contains more caffeine than Arabica beans and will be bitterer in taste. They are about half the price of Arabica beans and will often be mixed in with Arabica beans (unless specified otherwise) in retail situations. They are often used in instant coffees and gives a strong hit. Where a coffee bean is grown (and how it is farmed) is what will give coffee its unique flavor characteristics. Soil, elevation and organic quality are important factors in bean farming systems. As is any method used for processing the beans. Over 50 countries produce coffee beans, and within each region, there are likely more subcategories of beans. Below we detail some of the general characteristics of the most popular regions. Ethiopia is where the coffee bean was first discovered somewhere around 800 AD. The beans from this region are thick and contain nuances of berry. Brazil produces the majority of the world’s coffee, and you will find beans from this region in many store brand espresso blends. They produce thicker (or heavier) coffee and are usually in dark roasts. Columbian blends are extremely common in The U.S. and are balanced with a touch of acidity. They may have fruity hints and are mostly used for light roasts. Hawaii is the only U.S. State that grows coffee beans (commercially), and they come with a unique floral note. They are used in mild roasts and have mellow acidity levels. Kenyan coffee beans are strong in flavor, but not necessarily color. They may have some blackberry undertones and contain a medium acidity level. Coffee beans from this part of the world are fairly dark in color and provide an earthy quality. They will produce brews with a much longer aftertaste. Coffee grown in Guatemala is bright (acidic) and slightly bittersweet with fruity notes and spicy undertones. Vietnam harvests large part of the worlds coffee beans (second to Brazil) but the local beans are 90% Robusta (most of the worlds Robusta beans are grown in Vietnam). These beans are explained above in this guide and usually provide a bitterer flavor and are not as commonly used as Arabica beans. Roasting beans is an artful science. A bean’s roast predicts the flavor and tastes of any brew. Acidity, aroma, and body are all foreseen according to a bean’s roast. Acidity is the slight sharpness of your tongue, aroma is what gives coffee its smell (or floral or berry tones), and body refers to the thickness or how heavy a brew will be. And no roast is the best or worst. They all contain their features. Light roast beans will be a light shade of brown and have lower acidity and body. These beans are not roasted long enough for oil to break through the bean surface. Low acidity levels mean you won’t be drinking bitter coffee. This also means your stomach can enjoy more coffee. If you enjoy coffee, this may not be strong enough for you. The tastes nuances are easier to spot, but light roast does not produce bold flavor. Not suited for espresso brewing techniques or drinks. Medium roast means darker in color than light roast and more acidic. This roast is often referred to as an “American” roast or “Breakfast” blend and is the most common amongst Americans. Medium roasts are the most popular and offer a well-balanced brew. You can taste the real flavors of the coffee without any component overpowering another. They are widely produced in a huge variety. There are tons of options and new roasts being put on the market all the time. 1. If you prefer less body or take your coffees “light and sweet,” stick to a light roast. Although the beans are darker in color, they are still not best suited for espresso brewing. Dark roasts will be heavier bodied (or thicker), almost black and produce bold flavors. They will contain an oily surface since the beans are roasted for a longer period of time. They will also carry a bittersweet aftertaste. Dark roasts are popular amongst people who prefer black coffee. If you don’t use milk, you will achieve the best flavor with a dark roast. Great for espresso drinkers and anyone who wants a good latte or cappuccino. They produce an oily coat and are not a texture for everyone’s tastes. Dark roasts are not necessarily the type of coffee you want to sip slowly. If you prefer lower acidity levels and higher quantity, these are not for you. A coffee bean is not a bean at all. It’s a pit from inside a berry (one that resembles a cherry). The coffee berries used to be served as food before anyone realized what the pits could do. These berries are grown all over the world and can be grown in a variety of conditions. What is the difference with espresso beans? There is no particular difference. Espresso speaks to a brewing technique, more than it does a bean. There are different roasts (light, medium, and dark) from various regions of the world, but not specific “espresso” bean. However, dark roasts are commonly used to brew espresso. And the dark roast beans are usually ground much more excellent for the espresso brewing process. Buy espresso beans here. Arabica beans are about 1.5% caffeine, and Robusta beans are about has 2.7% caffeine. Robusta blends will have nearly double the amount. Most blends will contain a mix of species or advertise that they are 100% Arabica. And more caffeine does not necessarily mean more flavors. How do they decaffeinate coffee? There are different methods of decaffeinating coffee beans. One common process is done with solvent. With this method beans are first steamed and then put under high-pressure contact with the solvent. Another process is with carbon dioxide. When beans are mixed with the carbon dioxide, the caffeine combines with the compound and is then extracted from the bean this way. What is a French Roast? French roast, like espresso, is usually a dark roast. They produce a dark brown coffee with an oily coat. Even coffee houses are naming their blends now, but there are a few common specific roasts names like French or Italian. Full City or City roasts are usually medium roasts, and Cinnamon is a variety of a light roast. Does size of the coffee bean matter? Primarily producers use the size of a coffee bean. Consumers do not need to know the exact measurements. However, producers and farmers measure the beans by the size of the holes on the screen that is used to sort the beans. You may not need to know the exact size of your coffee beans, but producers need to pay attention. Beans of the most similar size will make for the most even blends. How do I know correctly grind coffee beans? This depends on what type of roast you have and what type of coffee maker and grinder you are using. If you have light roast coffee beans, these are best used with automatic machines. Paper or re-usable filters are used so beans should be ground to an average size. If you are using an espresso machine, and a darker roast, your beans should be ground to a much finer size. Look for more details with your grinder and coffee machine information or manufacturer. Green coffee beans raw or unroasted coffee beans. They are softer than roasted beans and need to roast before they produce any coffee like aromas or flavors. Other coffee beans should be drunk within a few weeks of roasting for excellent taste. However green coffee beans can last up to a year if stored properly before brewing. You can buy here. Can I overdose on coffee? Yes. But that would take 100 or more cups of coffee in one day and is highly unlikely. If you have health concerns or heart conditions, you should speak with your doctor before consuming any caffeine or coffee. Remember, decaf is always an option and does not mean sacrificing flavor. Why are coffee prices rising? Conditions like weather and financial status of any region may affect the cost of coffee everywhere. If supply and demand are not in balance, then prices fluctuate. Some countries are projecting lower harvests in January of 2016 than ever before. And since prices have bottomed out, it is more common to see supply cuts from producers. Just like any big business, the world’s economy has its inevitable effect. Are coffee beans good for your health? There are various studies into the effects of coffee on our bodies. Many of these studies have shown that drinking coffee has positive effects and can help fight against conditions like Parkinson and Alzheimer’s disease. It is also believed to decrease the risk of depression and improve cognitive function. Drinking coffee will increase fatty acids in the bloodstream, thus allowing muscles to absorb fat better and turn it into fuel. They are even used as antioxidant components in facial and skin treatments. Coffee and coffee beans are extremely useful to your well being, regardless of their flavor. You can in-depth book, How Coffee keeps you Healthy by Dr. YiFang Chu.